In the conference committee on HB 2602 establishing the dyslexia task force, Clay Aurand (R-Belleville) went to work immediately in an attempt to keep teachers off the task force. Aurand apparently believes teachers have nothing to offer on education issues. Aurand, who has led the effort in the House to keep teachers from being treated as professionals, personally working tirelessly to stifle those legislators who seek to return due process rights to teacher, took his fight against teachers and KNEA in particular to the negotiating table today. Senator Molly Baumgardner (R-Louisville), the Chair of the Senate Education Committee, had amended the task force bill to add four teachers (one special education, one reading specialist, one elementary classroom, and one middle school classroom) to the task force. 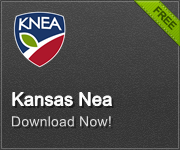 Two of those positions would, under the bill passed unanimously but the Senate, have been appointed by the Kansas NEA. Aurand led things off by asking for the teachers to be removed and replaced by legislative appointees. Baumgardner pushed back asserting that it was critical to have teachers – boots on the ground in working with children. Through the back and forth negotiations, Aurand tried repeatedly to take the teachers out and then, if they had to stay, make them legislative appointees. Baumgardner, along with Senator Pat Pettey (D-Kansas City) and Representatives Valdenia Winn (D-Kansas City) and Brenda Dietrich (R-Topeka) argued forcefully to keep both the teachers and the KNEA appointments. Eventually, it was agreed to keep the teachers but to give authority to the Chair and Ranking Minority Member of the Senate and House Education Committees to make two joint appointments – one legislator and one classroom teacher. The agreement will now be put into a conference committee report and submitted first to the Senate, then the House for adoption. The House Judiciary Committee to record fast action in pressing a constitutional amendment, first dramatically amending and then passing a proposed amendment on Article VI of the Kansas Constitution. Introduced on Thursday, March 29. Informational briefing on Monday, April 2. Public hearing on Tuesday, April 3. Shoved out of committee on Wednesday, April 4. In four work days, the Legislature decided to change our constitution in a radical way, stripping from the citizens of Kansas the right to seek relief in the judicial system when the Legislature fails to provide for the education of their children. An amendment by Committee Chairman Blaine Finch would separate adequacy from equity in school finance considerations. The Legislature gets to decide what is adequate funding with no review permitted. The Legislature also gets to decide how to equitably distribute funding but the court would be allowed to review that. If this is passed, and the funding increases in HB 2445 were to pass, a future Legislature could decide to cut or end the future funding increases in the bill and there would be no ability for any citizen to challenge that decision. Let’s make it clear – the schools are not breaking the state budget. KASB provided evidence to the committee that the share of the state budget going to K-12 education has not changed over the years. The state budget was broken by the ill-advised and failed 2012 Brownback tax cuts championed by the same people who are pressing this amendment. Committee Democrats and some Republicans explained their intentions to vote no in eloquent remarks before the vote. Republican Representatives Elliott, Cox, and Becker, and Democrats Bishop, Carmichael, Highberger, Curtis, Miller, Kuether, and Hodge all spoke against the amendment. HCR 5029 passed on a vote of 12 to 10. I hope our KNEA Representatives plan to lobby heartily AGAINST this Constitutional Amendment. Destruction of the fundamental principle of checks and balances in a Democratic government only creates more, and unforeseeable, problems.